OSHA issued the following new or updated compliance assistance resources from October l to December 31, 2017. For a listing of all new compliance assistance products issued by OSHA, see OSHAâ€™s New Compliance Assistance Products webpage. OSHA has issued a new and revised fact sheets to help employers comply with OSHAâ€™s respirable crystalline silica standard for construction. The fact sheets review dust controls that can be used for equipment and tasks listed in Table 1 of the construction standard. OSHA has announced that the second annual Safe + Sound Week will be held August 13-19, 2018. The week is a nationwide event to raise awareness and understanding of the value of safety and health programs that include management leadership, worker participation, and a systematic approach to finding and fixing workplace hazards. OSHA has announced that the fifth annual National Safety Stand-Down to Prevent Falls in Construction will be held May 7-11, 2018. OSHA's redesigned training web pages provide information on training requirements and resources, outreach training (10- and 30-hour cards), OSHA Education Centers, and Susan Harwood Training Grants. OSHA has updated its web page to reflect the annual adjustment to its civil penalty amounts, as required by the Federal Civil Penalties Inflation Adjustment Act. Penalty levels increased approximately two percent. OSHA has issued several fact sheets related to maritime employment. The fact sheets cover commercial fishing (safe housekeeping and sanitation practices and shipboard pedestal crane safety), longshoring (safe baggage handling at cruise ship terminals), and shipyard employment (evaluation of fire and rescue services). A new OSHA fact sheet reviews steps to keep workers safe when installing reinforced plastic tarps, commonly called "blue roofs." These tarps provide temporary protection for the roofs of homes and other buildings damaged during severe weather. The following materials developed by grantees under OSHAâ€™s Susan Harwood Training Grant Program were posted on the OSHA Web site from October 1 to December 31, 2017. See the OSHA Web site for a complete list of a materials developed by Harwood grantees. These materials do not necessarily reflect the official views of OSHA. The Latino Worker Resource Center developed training materials in English and Spanish on fall protection in construction. The State Builders and Construction Trade Council of California developed training materials on hearing conservation in construction for workers in small construction companies. Waubonsee Community College developed training materials in English and Spanish on temporary worker hazards. The grantee also developed training materials for host employers and staffing agencies. Hesperian Health Guide developed a train-the-trainer instructional package in Spanish on common workplace chemical hazards across multiple industries. The Pennsylvania Technical Assistance Program developed training materials in English and Spanish on the Hazard Communication Standard, including hazard classification and labeling. The Construction Advancement Foundation of Northwest Indiana developed training materials for workers in the chemical, refinery, and construction industries. Topics include confined space, electrical safety, excavation safety, and fall protection. AgriSafe Network developed training materials for farm workers and producers in high-hazard operations, including pork, poultry, fruit/vegetable production, and grain production. The grantee also developed training materials for young agricultural workers and their employers. The following products were issued by OSHAâ€™s Alliance Program participants as part of the Alliance Program from October 1 to December 31, 2017. These products do not necessarily reflect the official views of OSHA. For a complete listing of Alliance products, see the Alliance Program Participants Developed Products page. A new hazard alert reviews the use and capabilities of multi-gas monitors in oil and gas exploration and production. The alert was developed by the participants in OSHAâ€™s Alliance with the National Service, Transmission, Exploration and Production Safety (STEPS) Network and the National Institute for Occupational Safety and Health (NIOSH). An updated NIOSH web page provides information on robotics, including the NIOSH Center for Occupational Robotics Research. NIOSH has issued a report on fatalities in oil and gas extraction in 2014. The report is based on the NIOSH Fatalities in Oil and Gas Extraction (FOG) database, which collects detailed information on fatalities in this sector. The NIOSH Fatality Assessment and Control Evaluation (FACE) Program conducts investigations on workplace fatalities to identify the factors that contributed to these fatal injuries. This information is used to develop comprehensive recommendations for preventing similar deaths. The NIOSH Fatality Assessment and Control Evaluation (FACE) Program issued the following reports and products from October 1 to December 31, 2017. Laborer Falls 12 Feet Through Barn Roof - Washington. Fatality Narrative as slideshow. Trucking Safety Videos - Midwestern Insurance Alliance and Kentucky FACE (Getting In/Out of Truck Cabs; Getting In/Out of Trailers; Cranking Trailer Landing Gear; Opening/Closing Trailer Doors). Farm Laborer Dies When UTV Struck by Vehicle - Washington. Fatality Narrative as slideshow. CPWR created the Construction FACE Database, an Excel database to facilitate use of the information in the NIOSH FACE reports. The database includes data from NIOSH and State FACE reports on construction-related fatalities (768 deaths) that were posted on the NIOSH web page as of June 30, 2015. CPWR has issued a study on "Applying Prevention through Design to Solar Systems in Small Buildings." CPWR also issued a one-page summary of the study and a safety protocol for solar panel system designers and installers. CPWR has issued a Quarterly Data Report on "Electrocutions and Prevention in the Construction Industry." 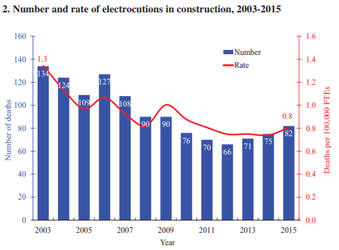 While electrocution deaths in construction decreased by 39% from 2003 to 2015, 82 construction workers died of electrocution in 2015. CPWR has issued a Noise and Hearing Loss Hazard Alert to promote hearing protection in the construction industry. Questions or comments about this newsletter? Contact Us. Want more OSHA news? Sign up for OSHA QuickTakes here.